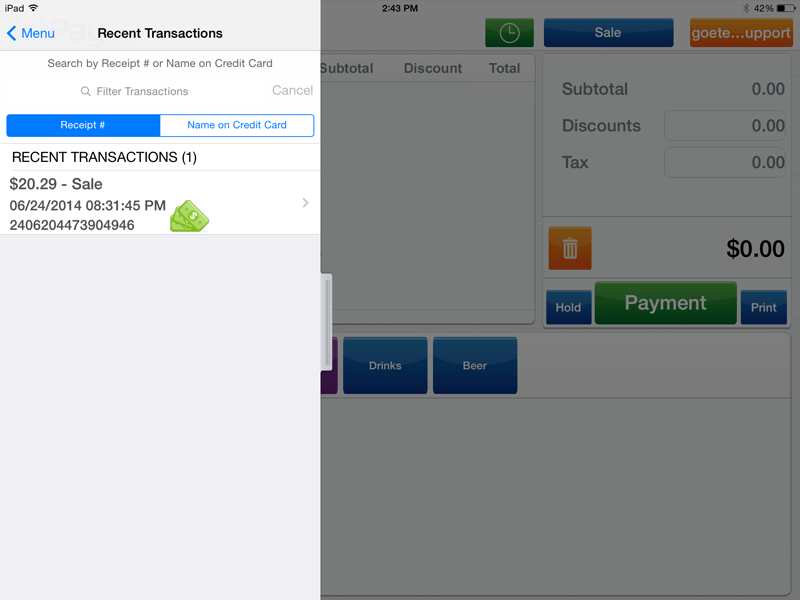 1stPayPOS allows users to easily look transactions up and perform basic tasks. 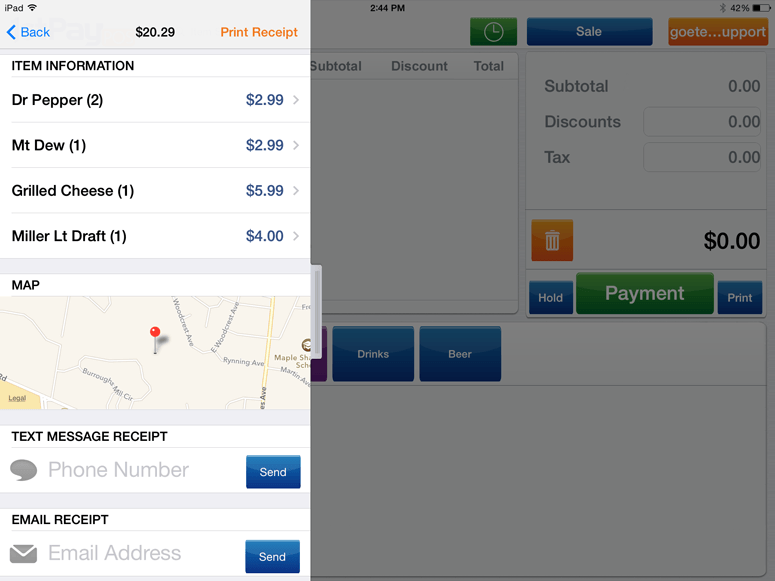 To see your recent transactions in the iPad POS app, open the side menu and select 'Recent Transactions'. You will be presented with a list of most recent transactions. This list will tell the user the transaction amount, transaction type, how payment was accepted, what time the transaction took place, and the receipt number (Order ID). Tapping on a specific transaction will pull up the details of that transaction. At the top of this view, you can process a refund or a void for the customer. When processing a refund, 1stPayPOS will ask which items are being refunded and why the customer requested a refund. Read more on refunds and voids here. The transaction information also enumerates all of the items that were added to the transaction (both the item itself and how many of that item was in the transaction). 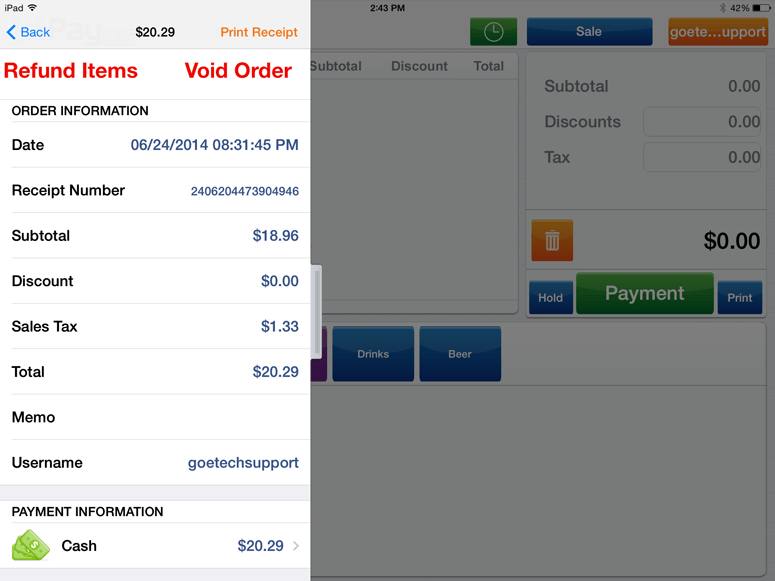 Tapping on an item gives details, if applicable, about the item as it was ordered. For items with modifiers, you would be able to see which modifiers were selected here. Any details entered in the Memo field would also be displayed here. Important Note: 'Recent Transactions' only reports transactions submitted on the iPad that the employee logged in will have permissions to see. You would actually need to perform a search (in the 1stPayPOS app or Transaction Center) to find a transaction amongst all the transactions for your account. If you are trying to pull up information on transactions from a computer, you would need to either run a report in the portal applicable to the transaction in question OR search for the transaction in the Transaction Center, which works differently. See Portal Reports or the Transaction Center section for more information.